A total of 145 parishioners from St. Augustine will be traveling to Rome, Italy, to attend the Music Festival of Peace and Brotherhood on March 21-25. The Chancel Choir and The Children’s Choir, along with parents and family members, Fr. Ed Dura, and Sr. Nona Barairo will be representing not only the St. Augustine Parish, but also the City of South San Francisco and the entire San Francisco Archdiocese. Both choir groups will be singing together with their local Italian counterparts during the four exciting days of choral music and cultural exchange. The Festival concerts will take place in breathtaking venues throughout the cities and towns of the areas surrounding the southeast of Rome. The main highlight of the trip is the St. Peter’s Basilica, where our very own St. Augustine ensemble will be singing during the 12:15 PM Holy Mass on March 24, 2019, making this truly an experience of a lifetime. Who would imagine that these two local SSF choir groups will get to perform in Castelli Romani, Italy? Taking this large number of people to Rome is not a simple task to say the least, given the short time frame they have to work with. It takes significant communication and coordination, substantial financial support, and strong spiritual focus to make this once in a lifetime experience happen. This extraordinary trip was made possible by the collective talents and effort of each individual choir members and their family, the support of generous donors and individual contributors, and the guidance of Sr. Nona Barairo and Fr. Ed Dura, with the blessing and support of the new St. Augustine Parish Pastor Ray Reyes. 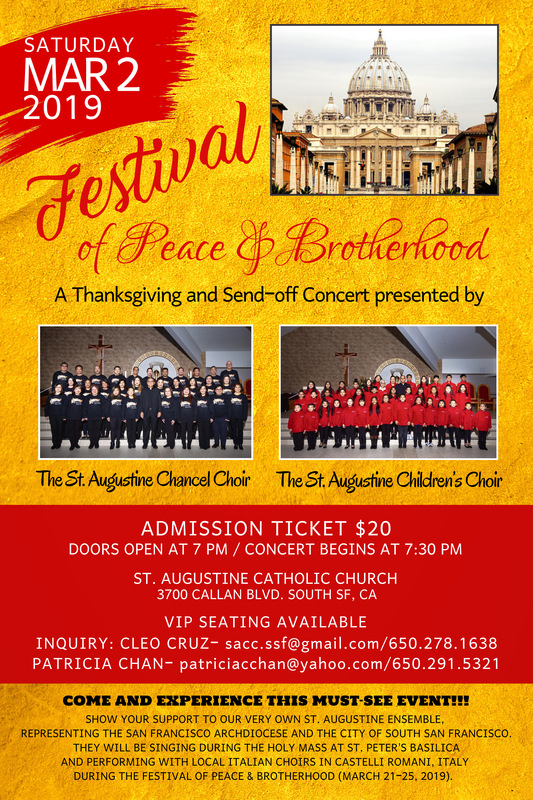 A Thanksgiving and Send Off Concert is scheduled on Saturday, March 2nd at 7:30 pm in St. Augustine Catholic Church. Everyone is invited to watch this must-see event. Come and support our local SSF choirs in their upcoming trip to Rome, and be part of the SSF history. Admission tickets ($20) and VIP seating are available by contacting Patricia Chan (patriciacchan@yahoo.com/ 650.291.5321) or Cleo Cruz (sacc.ssf@gmail.com / 650.278.1638).